After waiting around all summer for the hockey season to roll back around the time has come. It’s that time of year when Oilers fans are filled with hope, recharged, and ready to watch games without a feeling of dread. This season, we wanted to find more ways to bring the Nation together aside from hoping for meaningful games in November. On Thursday night, the Edmonton Oilers kick off their regular season in St. Louis and all of us from Nation HQ will be making our way to the Pint to take in the festivities and have beers with you fine citizens. (Tickets are still available) It always gives us a charge to see so many of you rocking NationGear all in the same place. Beautifying you citizens with NationGear is a goal of mine, and I want to make that happen whether you pay for it or not. How will I do that? I’ve got some ideas. Take a moment and drink in the visual in the picture above. 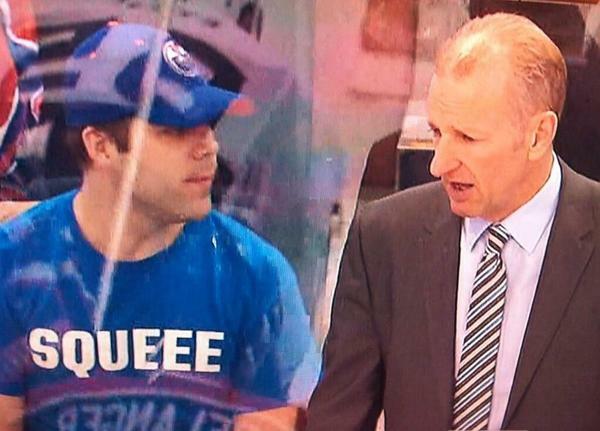 In it you will see longtime Nation citizen Travis rocking a now retired SQUEEE t-shirt right behind the bench. Not only does Travis look great, but wearing NationGear to an Oilers game is like throwing up a flag to find your fellow citizens. To connect with those people that you have suffered with throughout the dark ages we’ve been living in. I want more of you to be able to find each other and the world to see your beauty. If you have tickets located within the parameters listed above just email me a picture of your tickets and I will hook your party up with free NationGear to wear to the game. Pretty sweet, right? Understandably, some of you get your tickets at the last minute and that wouldn’t allow for enough time to mail something out. If you get your tickets last minute, email them to me and we will arrange for you to pick up your NationGear here at Nation HQ. Do you have tickets but aren’t Jay-Z rich enough to sit behind the benches? No problem! You can still win free NationGear – just take a selfie. If you’re going to the game, and want a chance to win some free stuff, just take a picture of yourself at Rexall and email it to me at baggedmilk@oilersnation.com. Each month we will pick a few random pictures and award the photographers with free NationGear just for playing along. From where I sit, this is likely the most productive thing you’ll ever do with your iPhone camera unless you have nudes to share with me. We’re once again stocked up on stickers! The breaking news is that we will be handing out Nation stickers to anyone we see at hockey games wearing NationGear. Rocking a Nation hat? Here’s a sticker for your troubles. Sporting a Golden Ticket tee? Now you’ve got a fresh sticker for your Hello Kitty binder. YakCity shirt gracing your torso? Stickers for you, bruh. You get the idea. Worried that you won’t be able to find us? 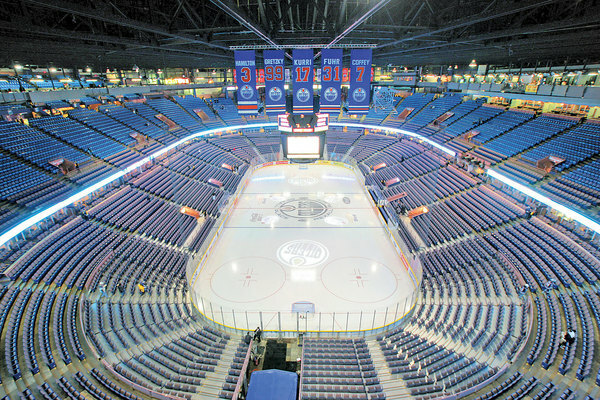 Anytime someone from Nation HQ is at Rexall Place we will make an announcement as to which section we’re in and where we’ll be during the intermission to hook you up. You’ll likely spend thousands of dollars on beer during the game so scoring a few freebies will always be welcome. Free NationGear in exchange for Free NationAdvertising. Not judging. Just calling it as it is. Nice bit of deduction there Holmes. Free stuff for the rich Teir 1 fans??? Oh the irony!! And the tier 2 fans have to send nudes for free stuff! I love nation gear. I have a bunch. Including the aforementioned Squee shirt. I am in Indiana That is a penalty box for life Right? Besides Gretzky did play here once before he was an Oiler. Please supply nudes at your earliest convenance. Not for me, but for a friend of mine of course. Where can we get decals for the back window of our trucks?? Just hit up Chris the Intern at chris@oilersnation.com and he’ll fire one out to you. Or you can stop by Print Machine on Gateway Boulevard. Whichever is easiest. It’s at such a great location. When I’m done at Print Machine, I can hop over to its neighbors Shellshock and the lingerie place before stoping at Hudson’s! Rats, sitting right behind the Oilers goal in sec 110. Guess the selfie business will have to suffice. BM, you HAVE to make this happen! Please send some Oilers Nation swag down to Red Deer…I will wear it with pride! when will there be hats in stock so we can wear said hats to the game?! We should have some new hat designs coming soon! My wife calls my man cave corner of the basement “the penalty box” where I go to feel shame… would that count? ? Can we have a contest where the winner gets closest to the exact game and time when Chris the intern gets busted by Oilers in-game staff for “conducting non-Oilers business” in Rexall? It could be a 50/50 thing where we raise his bail money. We would raise hell on his behalf! I see some of the proceeds of Nation Gear go to the “Earth Group”, is this charitable organization affiliated with the “Human Fund” by chance?